A kind act by a compassionate individual gave one family a bittersweet ending after the loss of a beloved pet. The loss of a four-legged friend, for some people, can be as devastating as the loss of a loved one. For Tammy Polley and her family, that heartbreak happened suddenly after their dog, Andy, was found dead last week after he succumbed to an apparent gunshot wound. Andy, a rescue dog, was a boxer/pitbull mix in his golden years. Although his breed indicates a large stature and a body build for athleticism, according to Tammy, Andy was a lovable lap dog. “I’d yell for him, and he’d come and jump in my lap”, said Polley. Andy also had a reputation in his West Portsmouth neighborhood for being everyone’s best friend. 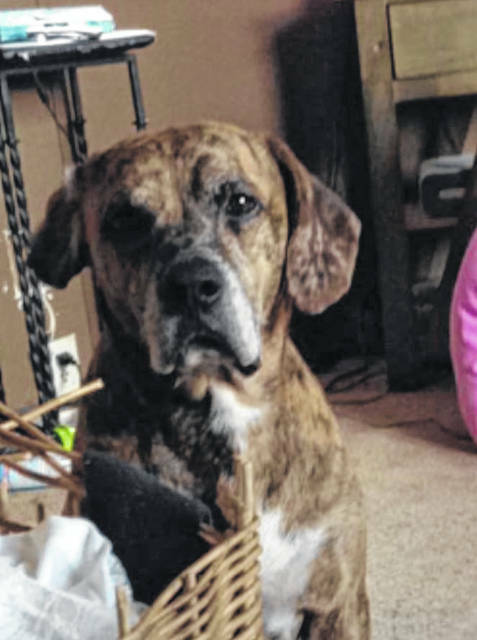 While Polley and her family tried to wrap their minds around why someone would take the life of such a sweet pup who was known to everyone, they could only hope that the individual responsible would be brought to justice as a result of the ongoing investigation by the Scioto County Sheriff’s Office. While the family was enduring the pain caused by this random act of violence, their story was being shared widely around the county and reached the ears of Caleb Wilburn. Wilburn, who is the director of Paws at Peace Pet Cremation, felt compelled to reach out to the family after learning about Andy’s untimely death. “I heard the story on the radio, and I knew I had to do something,” said Wilburn. Wilburn contacted Polley to share his condolences, and offered her cremation services for Andy completely free of charge. Touched by this generous act, Polley broke down in tears. “I was in the middle of a store when I got his phone call, and after he told me what he wanted to do, I just couldn’t stop crying,” Polley said. Wilburn picked up Andy’s remains from the family’s residence, and brought them back the following day. Andy was cremated and his ashes were sealed in an urn. The family was given a cast of his paw prints, a hair clipping, and a poem. Thanks to Caleb Wilburn and Paws at Peace Pet Cremation, Andy’s family now has these precious mementos to remember him by. What has been an emotional two weeks for Polley and her family has now come to somewhat of an end as their sweet Andy has finally been put to rest.